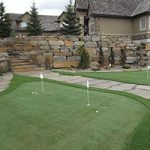 Ideal for landscaping and retaining walls. Wall Stone is available in mini wall which is suited for smaller garden walls or pahtways. 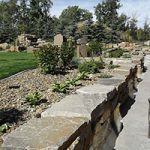 Natural wall stone is a great product for landscaping and retaining walls. It is also available in mini wall which is great a product suited for smaller garden walls or pathways. Hardy Island granite wall stone is an ideal product for landscaping and retaining walls. Its size varies from approximately 6 inches by 6 inches up to 18 inches by 24 inches in random shapes. Its weight goes from 50 to 75 pounds per square foot. The coverage of the retaining wall stone is 28 to 32 feet per ton. It makes a beautiful statement as an entrance to your home as well as doing its job as a durable and functional retaining wall. Whistler basalt wall stone works well for facing stone, dry stack retaining walls, and planters. Its coverage is 18 to 25 square feet per ton with sizes of 6 inches by 10 inches and to 18 inches by 18 inches. It comes in a thickness of 3 inches to 5 inches and has a weight of 50 pounds per square foot. Whistler basalt wall stone makes durable stacking retaining wall which is easy and affordable. Whistler basalt wall stone also is a perfect product to have a wall waterfall to enhance your properties natural beauty. 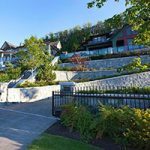 Natural wall stone, whether it be Hardy Island granite wall stone or Whistler basalt wall stone is the landscaping answer to all of your granite wall stone questions. 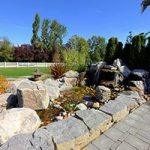 These stones are featured as beautiful entrances, walkways, retaining walls with many, many possibilities for design and layout. This sturdy, beautiful Hardy Island granite wall stone also makes a beautiful pillar to accent the landscaping. Whether surrounding your beautiful home in natural wall stone or finishing with any natural stone product it can only improve the value of your home, as well as the neighborhood beauty. In today’s world of disposable everything a Hardy Island granite wall stone retaining wall has duration and longevity with its old world look and quality and is not part of the disposable world we live in.